28. Mine Approvals May Be Hinging on the Corporate Bank Account - KJ Kuchling Consulting Ltd.
A few months ago there were some discussions on a now defunct blog site “I THINK MINING” and on a website (https://lindsaynewlandbowker.wordpress.com) regarding whether mine environmental approvals should be linked to the overall financial health of the parent company. This point was raised in regards to the Mount Polley tailing dam incident as well as other notable tailings failures. 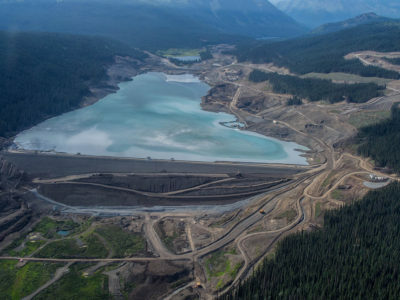 The logic behind the idea was that the potentially high cleanup cost for tailings failures could exceed the financial capacity of a small mining company and then the failure cleanup cost would need to be borne by the taxpayer. Are reclamation bonds of sufficient size? Closure bonds for final reclamation are standard practice in current permitting approvals and part of the normal course of business. However what is being newly proposed is the requirement to have sufficient corporate funds in the bank account to pay remediation costs for some hypothetical failure. This has not been part of the current environmental approval process as far as I know. Depending on the type of failure scenario one envisioned, the hypothetical cleanup cost could range from low to enormous. One of the options being proposed is that the various mining companies in a jurisdiction each contribute money to a failure cleanup fund that could be used for mitigation purposes. The ultimate goal of this idea may be better environmental practice or simply as a means to curtail mine development by handcuffing smaller companies. Many deposits are too small for the major miners so the intermediate companies are the only ones interested in them. However if they don’t have the financial reserves in the corporate bank account, then their projects would not get approved. It would impact on the ability for the smaller or intermediate miners to develop new mines if the corporate bank account of the parent company becomes a large part of the mine permitting process. Not only would they need to finance the construction capital cost, which is not easy these days, but they would also need to finance a tailings failure cleanup fund. It will be interesting to see if this suggested permitting approach gains any traction in the future because it could have a significant impact on the operating approach of the junior industry. Perhaps everyone could really only be exploration companies. One impact from this might be that new operators will be pushed towards dry stack tailings. Possibly the added costs for dry stacking could be offset against the need for the tailings failure fund. Regardless of how it would be done, this would become an added cost to the mining industry at a time when it doesn’t need more cost pressures. Mines require the capacity to cover unexpected costs. There are a number of ways to do that, including having the money in the bank or a letter of credit, which is essentially an insurance policy. But for how long? Should the money remain on account forever? When is a TMF considered stable?